This Red Sox fan has a very simple request – Re-sign Jason Bay and do it now! As a Yankees’ fan left in a comment on my blog (I have one here on MLBlogs), the Yankees are very content to sit back and swoop in with large sums of money if we do not re-sign Bay soon. I have begun a campaign on my blog to make the re-signing of Jason Bay a top priority for the team. I will not give up this campaign until it is “job done”. So please – resign Bay and do it soon. Hi – just stopping by to say – we need to make the re-signing of Jason Bay a priority for the team! Please get the job done now! Love that “vertigo” view from the monster seats.I was there for a Toronto game, after 4 cocktails at the Bleacher Bar….it was not pretty! 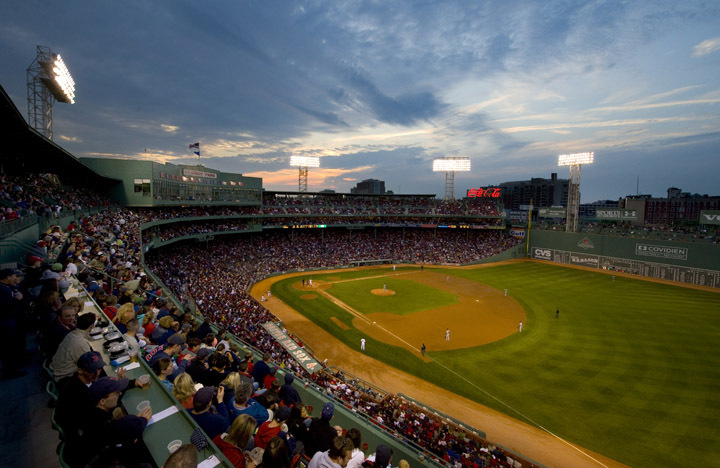 The twilight shines beautifully over the beautiful green of Fenway, don’t you think? I’m going to echo what Julia said–RE-SIGN J-BAY! We NEED his bat, and solid fielding, and the last thing we need is another “rotating” position. Now that Manny is gone, we need to make sure LF is a solid position! GET HIM SIGNED, THEO! GO SOX!